Back in April, the Early Learning Centre sent us a TP forest wavy slide with sandpit to review. When it arrived, I was a little shocked by the size of the box! It was huge, and very heavy. We had to wait for over a week to assemble it, as the weather was against us. Once the weather improved, we set to work! The chute had two slightly embossed circles to show where the screws needed to go through, but no pre-drilled holes. It’s not very easy trying to drill holes through slippy plastic! (We knocked a small nail through in the end, to pierce each of the circles, before screwing in the screws). Interestingly, the ELC website and the instructions say there should be 2 rungs to the ladder, but we received 3. The fittings for 3 were also included, so I’m assuming they’ve added an extra step now? 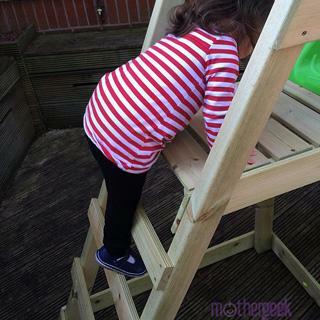 The extra step is necessary for Syd to climb up successfully – she’d never manage it otherwise. With all 3 steps in use, Syd can easily climb the steps by herself. 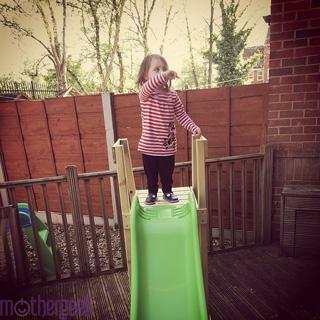 It took her around 3 attempts before she had the confidence to do it unaided. There’s no stopping her now, though! We haven’t attached the sandpit aspect yet, as we are about to redo our garden. The slide is currently positioned on our decking; but once it has been turfed, the slide (and the sandpit) will be moved onto the grass. The instructions do warn you to ensure the slide is positioned on a soft surface (not decking – like we are currently using). Our children are only ever outside with full supervision though, so we are confident they are safe enough for the time being, at least. sit with your back to the steps. metal gardening tools out of the way, though. Once assembled, the slide and the frame are really strong. The wood is solid, and the weight of the unit makes me feel confident it will last for years. You get a 5 year guarantee on the wooden frame, so you can be confident it won’t rot away any time soon. The wood is untreated, so you can always stain or varnish it to prolong its’ life. The entire structure feels really secure. I had no reservations in letting my kids play on there. It doesn’t rock or move at all when in use as it is on a 100% level surface. Sam loves to sit at the top and watch the trees sway in the breeze. This has become his favourite place to sit. Sydney spends a lot of time playing on the TP forest wavy slide. She loves to climb up and push her brother down the chute. Sam enjoys this too, and grins as he hears her approaching from behind. Last week, Syd spent around half an hour pretending she was a pirate. The top of the slide was her “ship” and the slide was her “plank”. 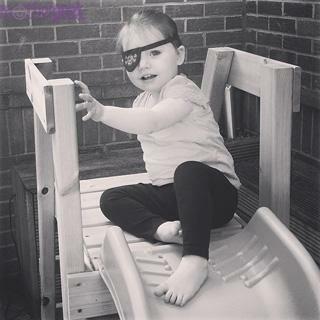 It was so cute watching her imagine a pirate world in our garden! As soon as the back door gets opened, it is a mad dash from the kids to the slide. Syd usually wins the race, and will say… “One, two, free… GO!” Before hurtling down the slide at top speed! The slide is incredibly slippy, and they do come off the end of it more often than not. We have ordered the TP slide extension in the hope of it protecting the bottoms of their trousers! 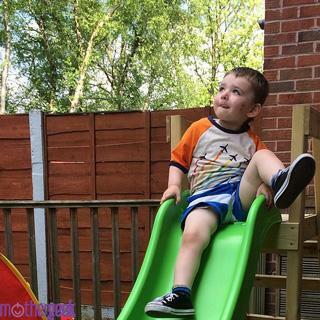 It is quite hard to explain to you in words just how much my children enjoy playing on the TP wavy slide with sandpit, so I have made this little show reel to share some of the videos I have taken of them on the slide so far. All told, we love the TP forest wavy slide. The waves on the chute seem to keep my kids happy too. Their old, straight slide didn’t get half as much use as this one does. I can think of a couple of improvements which could be made. The first would be to add pre drilled holes, to make assembly quicker and easier. This for me isn’t the end of the world, as once it was built, the quality and the fun my kids have had more than made up for the annoying measuring and drilling my hubby endured. 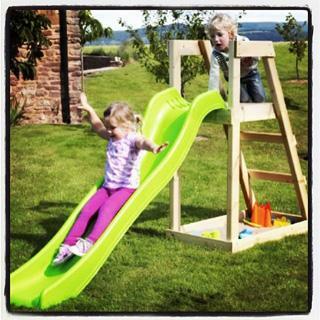 to stop your kids skidding over it as they come off the slide. Even with these two niggles, I think the TP forest wavy slide with sandpit is well worth the money. It is strong, and I am 100% confident it’ll last a long time! The sheer weight of it would make it pretty unlikely to blow away in Winter too, so I don’t need to worry about finding winter storage for it like I did with their older slide. I give it 9/10, and two huge thumbs up from all of us! 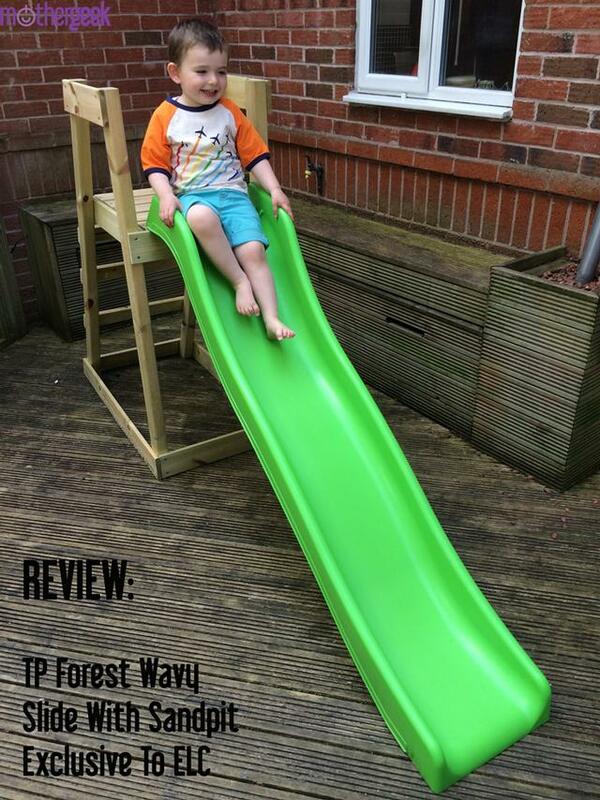 We were sent the TP wavy slide with sandpit to review, but all words and opinions are my own. 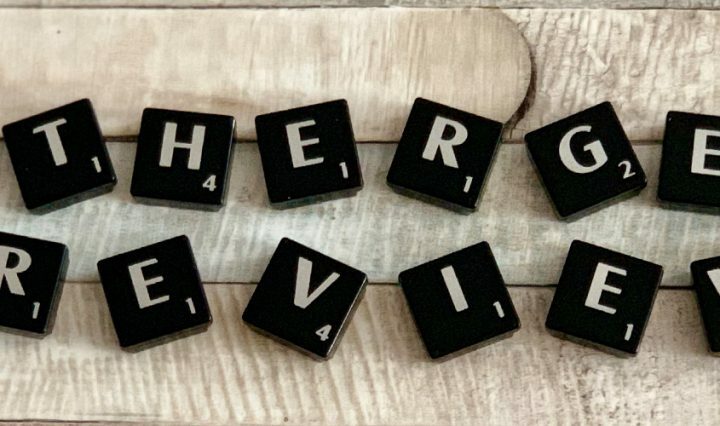 Feel free to check out my other reviews here.